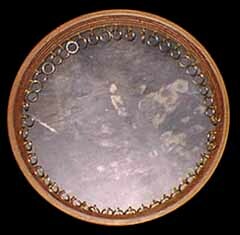 Also known as doira, this tambourine has small metal rings and sometime pellet bells attached to the inside of the frame. Playing techniques involve snapping the fingers against the head. Drums such as this are found in Iran, Turkey, China, Azerbaijan, and Afghanistan, among other places. A similar drum called daf (bottom photo) is used in Iran and features a series of 4 interlinked rings where on a ghaval (dayereh in Iran) there is a single ring. 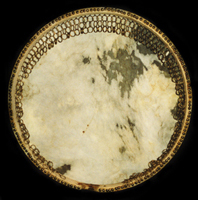 When the drum is tilted forward, the rings can touch the skin for a buzzing sound and the technique involves shaking the frame to create additional rhythms. The sound sample is of a ghaval.